Kverneland Group, a farm equipment maker, runs a warehouse in Thionville, France, which it uses to distribute components and spare parts for its machines globally. Mecalux has equipped this warehousing installation with pallet racks, cantilever racks and shelving for picking to streamline picking of 550,000 orders per year. Kverneland Group is an international brand that manufactures farming machinery. Its ploughs are of the highest quality, as well as being heavy-duty, dependable and long lasting with low maintenance and usage costs. The company opened in 1879 when its founder, Ole Gabriel Kverneland, set up his metal workshop on the outskirts of Stavanger (Norway). Years later, the workshop has grown into a global company, with manufacturers and warehouses spread throughout the world. Recently, Kverneland Group inaugurated a new 28,000 m2 distribution centre in the French city of Thionville allocated to storing components and spare parts for its machinery. As Franck Claudon, Director of Warehousing and Distribution Europe, explains, “Beforehand, our distribution centre was located in Flévy (north of Metz), but then we moved to Thionville in order to expand storage capacity and offer better customer service to our clientele.” With national highways close by, this fact has made this centre much more efficient when it comes to distributing goods throughout Europe. Kverneland Group assembles massive volumes of orders, meaning the warehouse has been specifically designed to facilitate this task. Each year it preps an average of 550,000 order lines that are sent to the company’s customers in the 79 countries is currently does business in, as well as to its other warehouses in Canada, Spain, the US, England, Ireland, Italy, Poland, Russia, etc. Properly organising the goods is the first step in streamlining pick tasks. In this warehouse, in particular, workers manage around 66,500 SKUs of different sizes, characteristics and rotation levels.“We must distribute products to the corresponding slots so we can locate and manage them easily when we need them,” points out Franck Claudon. Besides the huge number of orders to fulfil, the operators also manage daily inputs of 350 pallets and containers from Europe and distribute another 200 or 300. Pallet racks were installed in the facility with these requisites in mind. These racks stand 8 m high and, overall, offer a capacity to hold 41,749 pallets. It is a highly versatile storage system and one that adapts to the products’ sizes. Beams can be readjusted so that the storage slots are either bigger or smaller. There, the company’s team deposits wooden pallets and containers, for the most part. 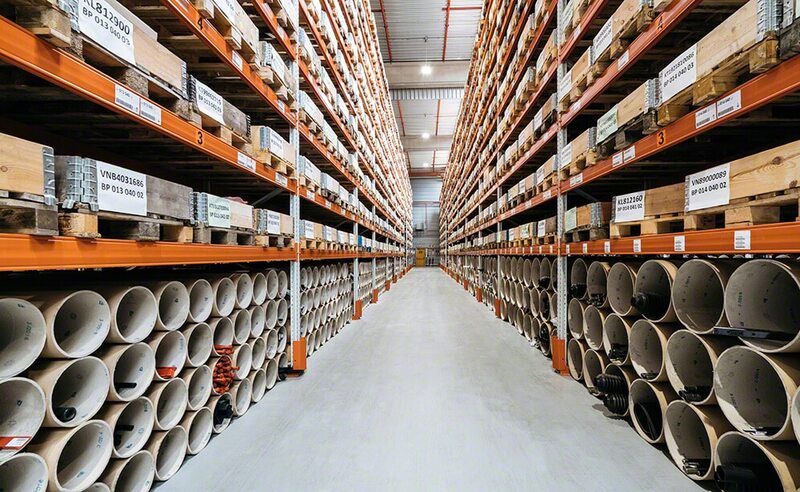 The warehouse also has four aisles lined with 7.5 m high cantilever racks. Here is where longer components are stored, for example, spray booms that can be placed on pallets or directly on the cantilevered arms.“These cantilevered arms are fixed to the racking upright and can be adjusted to suit our logistics needs,” mentions Claudon. Lastly, Mecalux has supplied shelving for hand pick tasks that are 7.5 m high and on which walkways or raised aisles are set, for a total of three floors of storage. This solution is ideal for Kverneland Group since, according to Claudon, “they use the height of the distribution centre to maximum available space and obtain better storage capacity.” Operators walk around the aisles picking the products that comprise each order directly off the shelves. Operators follow the order grouping method, which consists of preparing several orders during the same trip. Maximum surface area usage: the three storage solutions installed here optimise the available space in order to yield higher storage capacity limits. Speedier picking: direct access to the products on the racks is a crucial part of speeding up the prep of 550,000 order lines a year. Goods distributed correctly: products are slotted on the pallet racking, as well as on the cantilever and picking racks depending on their characteristics, size and rotation.